Two main-stem dams on the Green River and a trans-basin diversion from that waterway may emerge as the highest-profile projects Gov. Matt Mead is considering in his statewide water strategy. 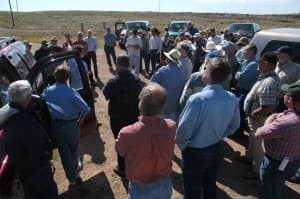 While the initiatives include large-scale conservation, like upgrading irrigation systems statewide, Mead suggested dam construction is on his agenda. But a history of conflict, not consensus or agreement, overshadows the potential pipeline and Green River dams. A trans-basin diversion from the Green to eastern Wyoming and Colorado inflamed passions when proposed in 2006. Before a federal agency rejected Colorado developer Aaron Million’s preliminary application in 2012, local governments in southeast Wyoming became intrigued by the prospect of a new water source. Now, the survey asks residents if they would favor a similar pipeline for Wyoming. 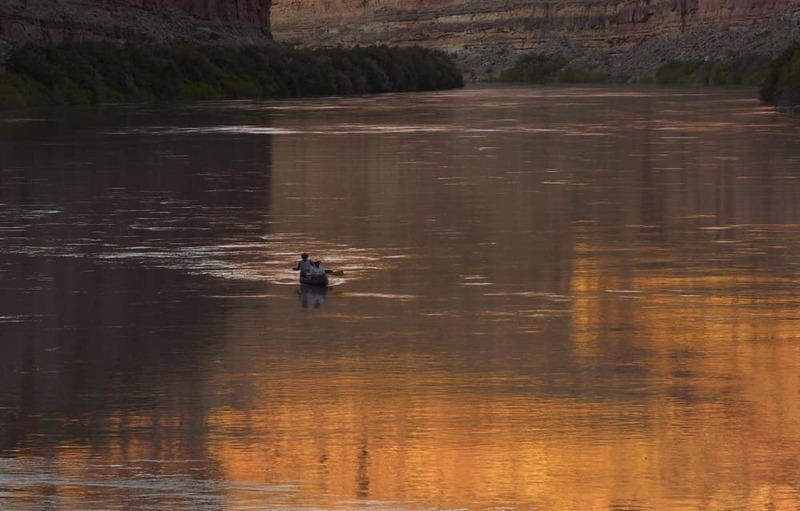 Fights over main-stem dams on the Green River have a longer history. Dams have been proposed and rejected over the last 50 years. The new list of potential projects includes a dam at Warren Bridge and another where the Green River crosses the Bridger-Teton National Forest boundary. At Warren Bridge, a dam would impound 150,000 acre feet, flooding rolling sagebrush and grazing country, inundating part of a path used by migrating pronghorn and disrupting angling on a reach protected by in-stream flow rights. About three miles from the second potential dam site near the forest boundary, the endangered Kendall Warm Springs Dace (Rhinichthys osculus thermalis) lives in a yards-long spring, which is its only home on the planet. The governor distributed the 67 questions in an online survey via email two weeks ago. The survey follows nine meetings in the state and advances Mead’s water strategy he announced during his state of the state address at the beginning of the 2014 legislative session. In addition to seeking input on the Green River dams, the survey asks about a dam on Rock Creek near McFadden and storage projects on the Wind River Indian Reservation. Eight to ten key strategy points will likely emerge from the 67-question survey, Wyoming Water Development director Harry LaBonde Jr. said. “A number of them will call for additional storage projects,” he said of the anticipated priorities. The governor’s strategy, “is going to bring more emphasis to the work we do,” in a department that has about a dozen reservoir plans underway. That a dam at Warren Bridge northwest of Pinedale is again up for debate baffles one conservationist, Scott Bosse, Northern Rockies director of American Rivers. After Sublette County in 2010 sought $750,000 in state funds to begin drilling and planning for a dam on BLM land there, the state water development commission and a legislative committee rejected the request. Among the reasons officials rejected the plan were a lack of demonstrated need, high costs and environmental impacts. While the Warren Bridge dam idea is referenced in the recent survey, it is not on the state construction list, LaBonde said. “It remains a viable site for a dam,” LaBonde said. Other survey questions seek opinions about conservation, restoration and management, including whether Wyoming should take over operation of federal Bureau of Reclamation dams. Nevertheless, dam building will attract a lot of attention, Bosse said. Five of the major projects considered for the strategy would be on the Green. The longest tributary of the Colorado, it is subject to the Colorado River Compact, legislation, court decisions and interstate agreements. Wyoming gets its share of water under the Colorado River Compact only after satisfying required flows to Mexico, California, Arizona and Nevada, said Jason Robison, a law professor at the University of Wyoming. Wyoming gets 14 percent of what remains. Colorado, Utah and New Mexico divvy up the rest. 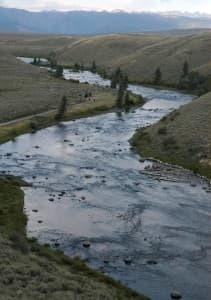 In low-water years, Wyoming could lose out, despite its location at the headwaters of the Colorado River basin, the survey says. 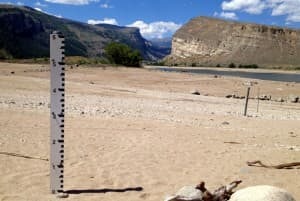 “Having access to storage in large reservoirs on the Green River will help prepare Wyoming to meet its future water needs and to meet obligations to downstream states in poor water years,” it says. Western states build reservoirs so they can capitalize on their share of water the compact allocates, Robison said. But if they don’t use their water, they don’t lose rights. In addition to the Warren-Bridge, the forest-boundary and trans-basin proposals, the state also mulls two projects on the Green involving Fontenelle Dam and reservoir. One would use wind power to pump water upstream from the Green’s Flaming Gorge Reservoir, perhaps to Fontenelle Reservoir near LaBarge. 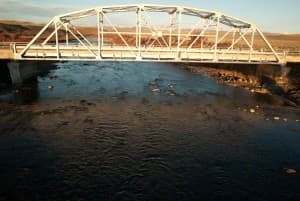 During times of high electricity demand and calm winds, water would be released from Fontenelle to produce hydropower. The final major Green River project would upgrade Fontenelle Dam, to “allow roughly 200,000 acre feet of storage to be utilized on the Upper Green without a noticeable impact on the environmental footprint of the development.” The 20-mile-long reservoir has a “total capacity” of 345,360 acre-feet but an “active capacity” of 150,500, according to the Bureau of Reclamation. At issue is armoring on the upstream face of the mile-long dam to protect the structure from wave erosion, said Wayne Pullan, BOR area manager in Provo, Utah. Riprap only extends part way down the face, so the reservoir cannot be drained beyond a point before exposing the dam to erosion. Armoring wasn’t completed because there was no contract for that water at the time and the Bureau was being wise with taxpayer money, Pullan said. However, lawmakers today are looking for a way to use more Green River water, including the possibility of constructing a major industrial park. The park could be built in southwest Wyoming, where it would also take advantage of the area’s natural gas and trona. Toward that end, legislators early this year traveled to Edmonton, Alberta where they toured the $30 billion hydrocarbon processing complex called Industrial Heartland, which could serve as a model. The $30 billion project was developed with a number of public and private partners. Outside the Green River Basin, the governor’s water strategy list includes potential projects to upgrade the Glendo Dam and build a new reservoir on Rock Creek near McFadden. A dam on bucolic Rock Creek could help “provide assurance that Wyoming meets its obligations related to the North Platte in the face of increasing environmental pressure,” Mead’s strategy said. The survey also asks about potential reservoirs on the Wind River Indian Reservation, already the site of major irrigation and reservoir systems. Perched on the eastern edge of the Wind River Range, the reservation includes stunning granite gorges carved over the ages by glaciers and rivers. The country holds “some of the best existing locations in Wyoming for storage,” Mead’s survey says. Water is already stored on the Wind River Reservation at Boysen, Pilot Butte and Washakie reservoirs, and Bull Lake. Not all potential construction projects would be new and monumental. The survey asks whether a task force should examine large canal systems for upgrading to stem water loss. When the governor talks about “additional storage space,” he doesn’t always mean building new dams. “We want to look at the option to resize the level of some reservoirs we already have,” Mead said. Also, 10 “small water storage facilities” are being planned as part of the state’s “Ten in Ten Project,” one of the governor’s potential initiatives. It seeks to complete them in a decade. They would be located in Carbon, Sweetwater, Johnson, Hot Springs, Sublette, Big Horn, Sheridan, and Lincoln counties. They would range in size between 2,000 and 11,000 acre-feet. The survey is not a popularity contest in which a project with the most votes would advance as a priority. The state’s water development commission, a 10-member citizen board supported by LaBonde and his staff of 23, is charged with funding and developing water projects. While the commission has its own process for considering and proposing projects, “I’m charged with carrying out the governor’s directive,” LaBonde said. The commission was established in 1975. It receives funding from its own dedicated stream of state severance taxes on mineral production, which is separate from the state’s General Fund. As the governor’s office creates the water strategy, Mead anticipates close cooperation with the water commission, he said at his press conference. Many recommendations, including those for dam building or modification, would go through the citizen board. “That falls squarely in front of the water development commission,” LaBonde said of construction projects. The governor’s water strategy will bring “a greater emphasis on that part of our program,” he said. Mead’s survey is subdivided into four themes: conservation, development, management and restoration. Each has its own online survey form. He wants people to comment by Aug. 4. 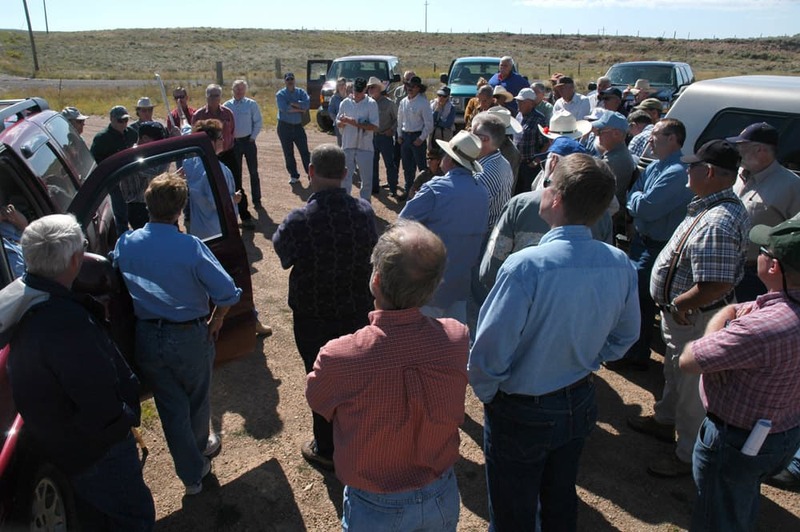 The survey about conservation and restoration asks 16 questions on topics ranging from recharging aquifers and planning for floods to using graywater from sinks and washing machines for irrigation. A state strategy could include better accounting to ensure municipal users pay appropriately for water and spending state money on private property for water conservation. The development survey asks about the major projects, and some other potential programs. 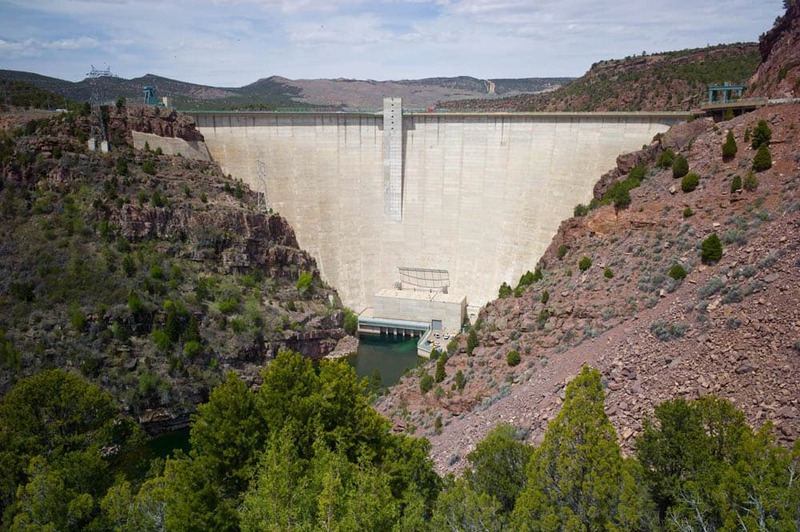 Whether the state should manage federal Bureau of Reclamation facilities such as dams one question in the third survey, which deals with water management. Other questions include whether the state should actively challenge federal attempts to “erode” state water authority and law. 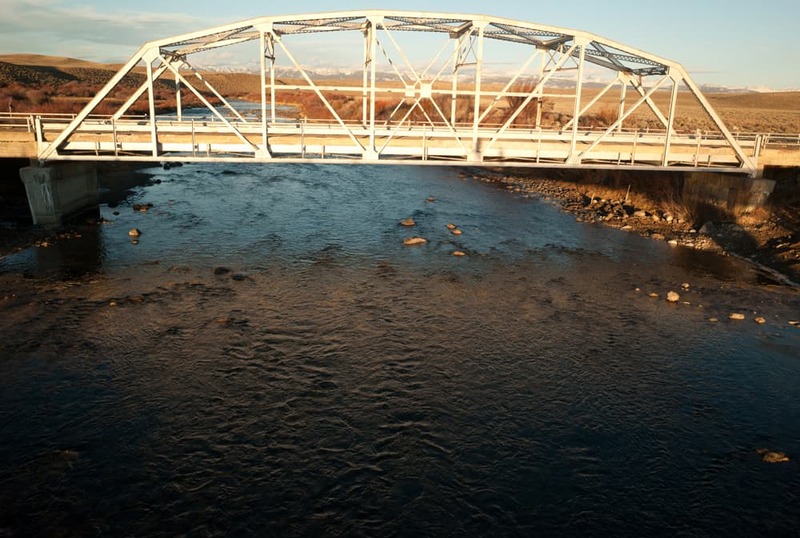 Finally, the fourth survey focuses on water and watershed restoration, including groundwater pollution at an abandoned Atlas Missile maintenance site about 17 miles west of Cheyenne, which threatens the city’s water supply. Other efforts could replace invasive Russian olive with cottonwoods or make irrigation systems fish-friendly. 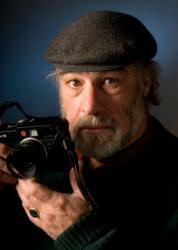 — Reports by Geoffrey O’Gara and Allen Best previously published by WyoFile contributed to this story. I know that the vision of dams on the Upper Green has been alive and well for decades but the longevity of the idea is not evidence of its merit. In fact, the thought of such dams is appalling; no doubt water is scarce and doubtless will become more scarce as climate change progresses, but the ‘cure’ for that is a sensible, widespread frugality, not actions that will be destructive of invaluable wildlife habitat, destroy a splendid fishery, and homogenize a region of subtle, even unsurpassed, natural beauty. It is, of course, relatively ‘easy’ (expensive, but easy) to slap up a few dams, much easier than it is to encourage industries and individuals to use water thoughtfully, but the dams are at best a short-term ‘fix,’ as is now recognized by responsible water agencies and ecologists around the country; as reservoirs fill with silt and rivers are destroyed, dams throughout the country are being removed, not built. It sadly anachronistic that Wyoming’s focus is on water storage and water re-direction rather than on education regarding the efficient use of water — as if some grave injustice were done to the citizens of Wyoming whenever water is allowed to escape the State’s boundaries unused by us. Of course, this has the ring of ‘good sense,’ especially if one has a suitably ‘possessory’ view of the world. The water is ‘ours’; not to use it, is to waste it, or so the ‘argument’ seems to go. But for all its seeming sense, this is actually nonsense. Water not used by us is not wasted; it does not vanish, it remains to nourish other people and habitats. In fact, more water is wasted by storing it (because of evaporation); making available to others what we do not need is not a form of waste at all. Has anyone in the government actually calculated the loss of water due to evaporation (especially in a hot arid State like Wyoming), made all the worse because the proposed reservoirs would be substantial in surface area but small in volume, since they would be extremely shallow (look at the topography)? This all adds up to water lost, not saved. Of course, we already ‘store’ a considerable amount of water in the region — the Green River Lakes, the Fontenelle Resevoir, and Fremont Lake, to mention just a few. What, exactly, is to be gained by two more dams on the Green, and at whose gain and at what cost to the environment, to wildlife, and to the natural beauty of the region? While it is perfectly sensible to be concerned about water resources (now, and especially in the future), such destructive and piecemeal projects as new dams on the Green hardly seems sensible at all. Further, folks who so presciently anticipate future water shortages seem oddly (and studiously) oblivious to one of its principal causes, namely, climate change — and ITS principal cause, namely, fossil fuels. Instead of addressing the underlying problems, the Green River Dams proposal only seeks to mitigate — and to make slightly more acceptable — one of the many harms that climate change is likely to cause. It is more than a little perverse for us to inflict further injury and insult to our environment (by building dams) as a means of minimizing the impact of the drought we continue to cause. Stop with the dams! Spend our tax dollars educating our industries and citizenry industry alike of the immediate need for conservation and for sensible, efficient use of water. Difficult to do, I am sure, but, all things considered, it’s this, not new dams, that will, if anything will, save our water and our increasingly fragile, threatened, and threatening planet. Dams end. Dams have a finite life, a cycle. Nobody ever talks much about the end portion of the lifecycle of a dam. Except the Colorado River Compact is a hopelessly flawed policy that heavily favors the downstream users and the metropolitan areas of the Southwest and California. 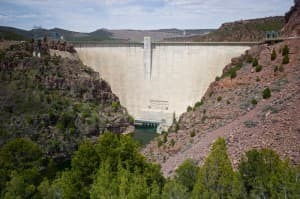 The chain of high concrete arch dams on the Colorado amplify and extend the problems with damming great rivers at all, creating artificial lakes, upsetting the flows. Water is a finite resource. The Colorado was over-allotted back in the 20’s during wet years of record flows and now the hopeless BuRec cannot pay the interest on the water debt , let alone the principal for the water it has promised to the users. Guv Matt Mead and other water mavens need to read or re-read Marc Reisner’s seminal book on the sordid history of western water projects, ” Cadillac Desert”. Do this before contemplating anything at all concerning impounding more Wyoming watersheds on a large scale. The history of dams in the West has been one of compounding bad decisions and bad policies and wretched politics. We cannot possibly continue those policies let alone expand them into a future faced with climate change that may be rife with eternal drought once water leaves the higher elevations of the Rockies. FInally there are examples like Anchor Dam west of Thermopolis on Owl Creek. A classic concrete arch dam that cost $ 60 million to build fifty years ago….and it does not hold water. The basin behind the dam is sedimentary and fractured from the weight of the new reservoir pooling on top of it. The water leaks away from Anchor Reservoir. Cows graze where a lake should be. A total blunder by Bu Rec because they just had to keep building these big damn dams, or their agency would wither. The Bur Rec and Army Corps of Engineers exist by earmarks for big projects, and have a terrible track record. We cannot extenuate them. It appears that Wyoming in its lust for impounding water regardless of need is willing to repeat or willfully ignore old mistakes . Great article Angus. I would hope that the governor does due diligence and solves water pollution issues from industry and water use efficiency first. The amount of water needed for fracking will only get worse as thousands more gas and oil wells are proposed to come on line within the next ten years. 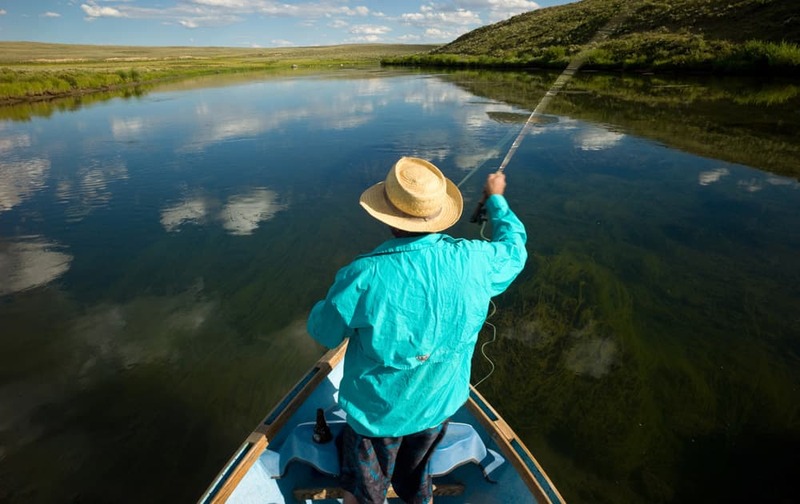 Combining that with a proposed major industrial complex in Wyoming’s southwest will have grave consequences on Wyoming’s largest industry, recreation and tourism which include hunting, fishing, camping and national park visits by locals and guests from around the world. This vital Wyoming industry depends on clean air and water, unobstructed migratory wildlife corridors and vistas. Also, will Wyoming residents bare the financial burden of these water projects only to have the fracking industry and the proposed new industrial complex take advantage of the resources without costs or responsibility? That seems to be the case with all the leaking wells in Johnson County, the worst in the nation. Although these wells are under federal control, there is plenty of blame to go around. I don’t think the state should be biting off more than they can chew as they did with the Two Elk Saga (http://www.motherjones.com/environment/2014/06/uninspected-oil-gas-wells-map) and (http://wyofile.com/wyofile/wyofile-publishes-first-e-book-complete-two-elk-saga-available-free-download/). By the way, another great in depth series from Wyofile on Two Elk. Congratulations again Angus on your new career. We miss you here in the Hole! Keep up the great work. I think I need to bump up my meager donation.